The feast is such a central indicator of a society’s values that Italian director Pier Pasolini uses it as the crux for condemning a culture he deems hypocritical and morally bankrupt; and he goes beyond metaphor to do so. In La Ricotta, Pasolini uses food not merely as a symbol of inequity, but as the most tangible element of hypocrisy and exclusion. The Italian auteur portrays separation and starvation as ironic elements of the feast that exist in the Roman Catholic society he critiques. La Ricotta—or “cream cheese” when translated—is a film about the making of a film of the Christian Passion narrative. This meta format allows Pasolini creatively to reveal the underlying structure of the overly produced farce that he thinks represents Italy’s rigid Catholicism at that time. The main character is Stracci (which directly translates to “rags”), an extra who plays the “good thief” who is crucified next to Jesus, and who is ultimately the only character in the biblical narrative to receive Jesus’ blessing and assurance of salvation during the event. In every way, Stracci embodies the character of the thief, who is condemned by his age but righteous through an outside perspective. He is only distanced from the trope of the Christ figure by functioning as a stand-in for the proverbial “everyman” and because he lacks the ability to bring about change or salvation within the narrative. Stracci’s crime in La Ricotta is poverty. 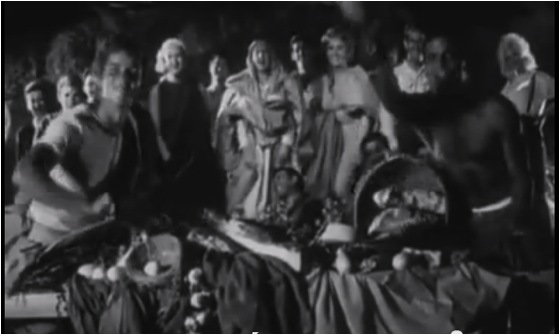 The film opens with a shot of a table overflowing with food while shirtless cast members dance about the set irreverently. Pasolini immediately cuts to Stracci, who is lying in the anguish of starvation off to the side of the set. Each actor in the film is given a daily lunch ration, but Stracci gives his to his young family, keeping nothing to nourish himself. The other cast members are aware of this and taunt Stracci with their own food and physically assault him to ridicule his weakness. Every day’s rations are used as a new way to marginalize Stracci and punish him for his difference. Interestingly, Stracci isn’t necessarily demonized by the other cast members; his punishment is administered to satisfy their desire for irreverent entertainment, not to make him atone for his poverty. This is because atonement suggests the possibility of the erasure of sins and restoration of one’s status and relationship to other members of the society—a state that Stracci cannot have hope of achieving. Pasolini paints a picture of Italian Catholicism that embodies the gluttonous, exclusionary, and sensual aspects of the feast. 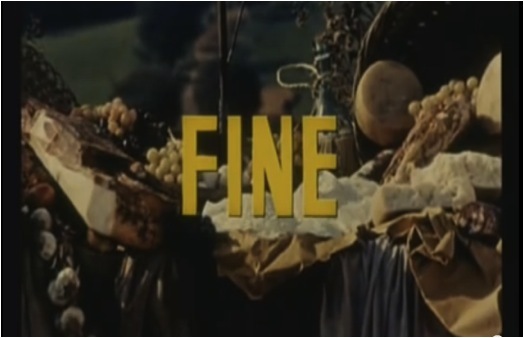 While Stracci is hanging on his cross, waiting for his scene to be filmed, his co-workers dangle food in front of him and force him to watch a strip tease performed by one of the female actors, mirroring the taunting of Jesus’ thirst on the cross with the soldier’s offering of vinegar. One woman even offers her extra food to her dog as opposed to coming to the aid of her starving peer, further calling attention to the complete lack of human compassion, and revealing the inverted structures of worth in the hypocritical theocracy, which claims to prioritize charity, purity, and brotherly love, but instead is hyper-focused on status, wealth, and immoral entertainment. Finally—though with the sole aim of cruelty—it suits the group of actors’ whims to provide food to Stracci. In a scene that is almost surrealist in construction, Stracci returns to a cave where he has managed to stash a loaf of bread. An angel appears on the other side of the cave, laughing deeply at Stracci’s ravenous consumption, which is shown at twice its natural speed to increase its appearance of desperation. Somehow, the number of laughing actors in the cave begins to multiply, and they begin throwing food at him from a distance, including a massive wheel of ricotta cheese. The foods keep coming in enormous amounts as Stracci frantically feeds himself with his hands. Finally, the entire feast table is carried in before him and lobbed at his corner of the cave. Stracci is then resurrected from this cave-tomb, only to be placed back on his cross and hung again for the scene to be re-filmed. Reporters show up to honor the prestigious director and capture photos of the famous actors while Stracci waits. Action is called, thunder roars, and suddenly the director realizes that Stracci is not saying his lines. 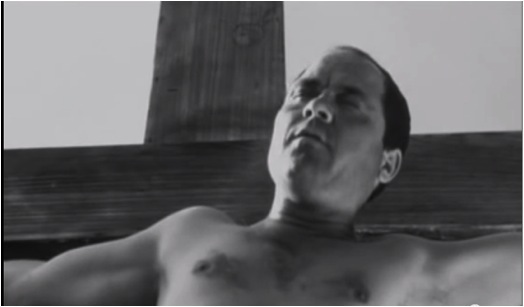 In front of the media, during the filming of this meta-Bible film, on his cross, Stracci’s heart gives out from starvation followed by the shocking consumption of mass amounts of food. Pasolini makes the choice not to show anyone’s reactions, with the assumption that while no remorse would be felt by the cast, remorse and righteous anger should be evoked from the viewer. The final shot is of a table, still piled with food for a feast. The Catholicism of Pasolini’s time has been consumed and transformed into simply another means for entertainment, profit-seeking, and exclusion. Stracci lives in a world whose construction is religious on its face, but immoral in its being, and Pasolini reveals this through the language of starvation and appetite. This Marxist critique was so powerfully damning that it even landed the director in jail for a few months for blasphemy. It is assumed he was given his daily rations.